Green Light Duo *, originally uploaded by [Zakkaliciousness]. Heading home from the supermarket in my neighbourhood. Note the cool green lights on the left that denote a bike lane. They are so sparkling bright at night. Copenhageners ride 1.2 million kilometres a day. Although not always accompanied by lovely green lights. i had no idea how inspiring your great photos have been. every morning when i check my email, i take a peek at what you've got showing and love the style, the bikes and the compositions of the pix. i even think its made an influence on me, as i've recently ordered another pair of high heeled boots, and just this morning realized its the impact of seeing all the lovlies riding in theirs. again! good work! thanks for the treats. although i keep looking, i've yet to find a similarly-clad bicycling woman here in des moines. but i shall continue my search. Thanks so much blue penny . . . so nice to get comments like that! Mostly rev . . . keep up the hunt! Is that a license plate on the back of her bike? hi macwinch: yes, but it's a Swedish Kronan bike, the old military bikes, and they include these 'licence' plates as a retro design feature. They serve no pratical purpose. nobody in their right mind here would propose giving bikes licence plates. what a waste of city resources that would be. I'm not sure your Burgermeister (City Major) may think the same... licence plates will ease the way to send fines directly to the bike impostor. It's a pessimistic point of view.. I know. Both Kronans and Skeppshults are available down here. Wonder what you think of them - how do they compare? but think of the paperwork. the police don't bother fining bikes very often here. there's too many of them. it would be a nightmare to implement such a system. rather spend the money on better infrastructure. deepbluesea... i prefer the skeppshult to the kronan. the kronan is a funky, chunky retro-kitsch bike but it doesn't ride very well. it's cheap, too, compared to other bikes. skeppshult is more bespoke and cool and rides lovely. Hi! I used your photo to illustrate a story about Danish biking technology! 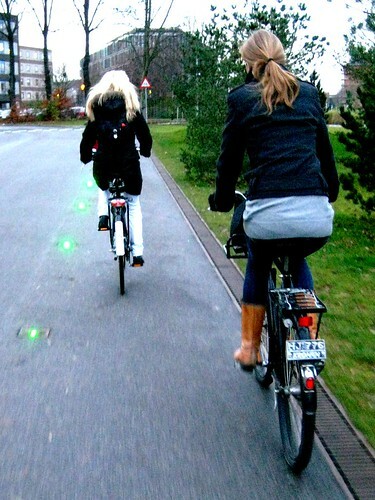 Apparently in Grenå and Copenhagen they are testing intelligent blinking lights to alert motorists to the presence of cyclists. Especially motorists turning right is an issue of concern which is addressed by these cool lights. The story is here at Ecoprofile. I credited your site for the photo and linked back to this page. Hope that's okay! And I hope you think the bike tech is as cool as I think it is! Maybe something for your delicious sister blog. Love your bike blog, both of them!